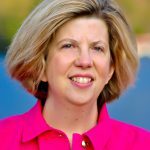 The following is a guest blog post by Maria Peagler, Founder of SocialMediaOnlineClasses.com and my collaborator on our upoming Personal Branding Webinar. How to Create Profitable Personal Branding? Personal branding is a buzzword being used so frequently it’s become almost a cliche. Most of my clients are confused about what it is, how they actually go about doing it, and why it’s important. So let’s toss out a few examples. All of these “brands” have taken hits lately that take your eyes off their core product: for Tom Cruise and Charlie Sheen, you instantly think of personal fiascos, not their body of work or their latest movie or TV show. Happy investors? Absolutely not. Why do you think Tom & Katie’s divorce happened so quickly? He knows the longer the media talks about his personal life, the less they’re covering his latest Mission Impossible movie. Gay Marriage or the Best Chicken Sandwich? Chik-fil-A has come under fire recently because of one their C-suite’s stance on gay marriage. People who had never before heard of Chik-fil-A now recognize the name and their“family-friendly” culture. Guess what? I already knew they welcomed my family, because my sons’ favorite fast-food restaurant is Chik-fil-A. They serve delicious, healthy chicken sandwiches and nuggets, offer books and educational CDs in their kids’ meals, have immaculate facilities and superior customer service. I didn’t need to know about their gay marriage stance. It didn’t matter. I wasn’t quizzing their cashiers on the company’s political affiliations. I’ll just take the healthy, delicious food, thank you. Your personal brand is essential because no longer do Americans (or most international professionals) have the luxury or desire for a single, lifetime career track. 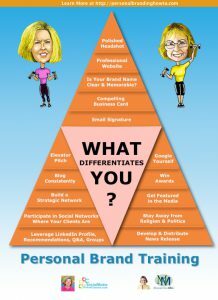 Your personal brand extends beyond your latest job position, startup company, or joint venture. Your personal brand is the entirety of you: your personal and professional reputation, tied into one big bundle. 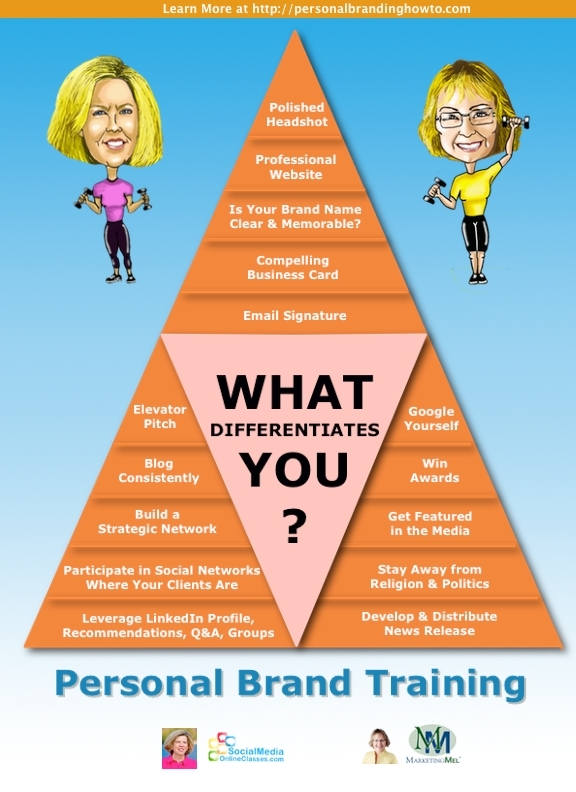 Want a quick snapshot of your personal brand? Google your name. Are the results professional and consistent? Could they use some improvement? Exactly what does it take to create profitable personal branding that you can be proud of? The Personal Branding Infographic I created with Mary Ellen “Mel” Miller of MarketingMel.com details 15 action steps to creating personal branding that becomes a profit center for you. Want to learn more? Join us for a FREE webinar Thursday, Sept. 13 at 1p.m. ET. (It takes less than 10 seconds to register here!) when we’ll be telling you exactly how to make your personal branding sticky for the right reasons, what to avoid, and how to create a long-term plan so you can develop your branding in stages. 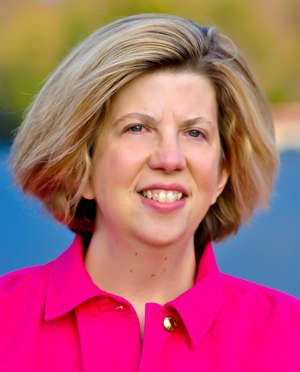 Maria Peagler is founder of SocialMediaOnlineClasses.com offers the World’s Largest Selection of 24/7 online classes on Facebook, LinkedIn, Pinterest, YouTube, Twitter, Slideshare, and WordPress. Maria is an award-winning author & publisher of eight books, a veteran technology trainer & she skyrocketed her latest book from unknown to Amazon’s top ten for two years using only social media. « Pump Up Your Personal Brand! You make a very solid point about personal branding being so important because work and careers now change so quickly and often. I don’t think it is a point that most people even think about for themselves. Great info to share here. Thanks Sue. Our personal brand is highly transportable in today’s job market! I’ll be sure to let Maria know you’ve commented as well. Thanks Maria. Seth Godin says we have two brands; the one we have and the one we want. I like the point you made that real brand can follow us throughout a career. I’ve found that to be very true with my own. While it is my brand in the work I currently do, it was present all along in the previous part of my career. Seth Godin is my hero. Such true words. You Jeff have a very professional and caring personal brand. Bravo. Your reputation is your brand and you have to live with it. It often takes more time to fix it than to create it. Bill you are so right about the importance of getting your reputation right the first time! When working with our private branding and web design clients and VIP brand consulting clients, I often ask them to Google themselves – and it astonishes me that the first answer is, “Why?” When I share with them how important it is to know how you “show up” I often find out that they have NEVER Googled themselves and have no idea what shows up. Ha Jennifer. Now “sculpting” is the perfect word for what some people need to do to their Google image! That’s when they need pro’s like us to help them. Great post and wonderful webinar last week! I just watched the replay and everything mentioned really solidified the importance of a strong personal brand. Many times in such a crowded and fuzzy market, your personal brand is your most important asset. Thanks for sharing your personal branding expertise Mel and Maria! So glad you found the information useful Sarah!